And we’re off….The preseason slate begins tonight at the PPL Center as the Hamilton Street Heroes(TM) training camp squad takes the ice for the first time versus the Charlotte Checkers at 7:05PM. I can’t promise you what the “Hockey Night” post will entail this season. Will it be every game? What form will it take? Will there be any post-game versions? Who knows? The future is unwritten. What I do know is that you will always get your money’s worth around here! 1. Who’s on the team this year? Once again this season, the Phantoms are loaded with high-level prospects as has been the Flyer’s method lately, to restock their pipeline, grow their own talent and get out of chronic cap trouble. They’ve also signed a fair few talented veterans to both lead the AHL team and, hopefully, make significant contributions towards success in the standings. Some of them you’ll know because they were either re-signed or have returned on multi-year contracts. No Media Kits tonight as far as I could tell, and the roster on the Phantoms site doesn’t appear to have been updated. I’ll try to give you some players to watch for, and some veterans you may recognize. Also keep in mind a bunch of guys are in camp who will eventually make up the Reading Royals–so expect to see some AHL/ECHL tweeners and such. You may want to check at fan services or purchase a program in order to get a complete roster before the game. Look for favorites such as defensemen 2 Mark Alt, 8 Will O’Neill, 20 Max Lamarche, 43 TJ Brennan and 44 Reece Willcox, and forwards such as 22 Chris Conner, 18 Danick Martel, 12 Tyrell Goulbourne, 19 Radel Fazleev, 16 Nic Aube-Kubel, 11 Steven Swavely, 14 Corban Knight, 10 Greg Carey–not to mention G Alex Lyon! 15 Mikhail Vorobyev: The 20yo Russian center has had a great camp and has had glowing reports about his ability to see the ice and make key passes. Also, our buddy dE alerted us to this guy last season and told me I should be looking forward to him as much (or more) than top pick Rubtsov, who’s now back in Juniors. 27 Phil Varone: The AHL veteran comes over from Binghamton to contribute top-six minutes with goals and assists as needed. You can think of him as the replacement for Miele, who bolted for Europe. 5 Philippe Myers: The young defenseman got high marks in Flyers camp last season and is mentioned in the same breath as past blue line prospects such as Sanheim and Hagg. Let’s see what he looks like up close! 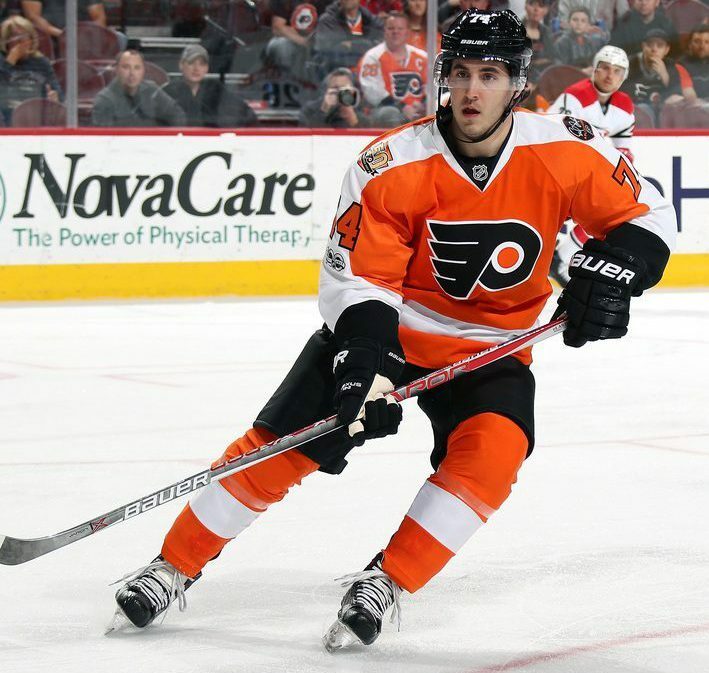 37 Mark Friedman: He’s been described as “Gostisbehere-Lite.” Really? Well let’s see then. That would be fun. G Mark Dekanich: The veteran goalie appeared in one game at the PPL Center last season–in a very difficult spot. He’s a cool follow on Twitter and has an even better beard. I don’t know if he’ll play tonight but I’d like to get another look after that disaster of a game last season. Veccione: I don’t have a number, but I’m looking forward to seeing the NCAA star on the ice in an AHL game. Oh, and one more thing: The Checkers are the AHL affiliate of Carolina, and Stortini is on the squad–so that’s where he is! Late notes have veterans Brennan and Knight with the evening off tonight. Yeah, unfortunately. We’ll likely not see Stolie in the Goalie at all this season as he has his knee repaired and rehabbed. Still officially on the Flyers roster are forwards Colin McDonald and Cole Bardreau. I believe the captain has a broken foot from blocking a shot with his skate, and that Cole has a broken hand. Of course, that information never comes officially from the team, so who it may not be 100% accurate. Both are in Allentown, I think, but cannot be added to the Phantoms official roster until healthy, from what I understand. Both are a week or three away, although I’ve read only optimistic quotes from each. 3. What’s up at the arena tonight? What else is there to before/during/after the game? Gates at 6PM with puck drop at 7:05PM as per usual. Check out the Phan Shop for any new gear. Does any of it have Adidas on it? Check out the third level on the East end of the arena, opposite the Miller Lite Loft: There’s a new group area up there and it may not be booked tonight so it might be a good time to see what they’ve done with it. Full Season Ticket Holders can pick up their ticket books tonight in the “rotunda” near the burger place. Bring ID. Check the back of the book to see what our bobble (or other gift) might be this season. Check out the sweaters tonight: It’s been a practice of the Phantoms to have a pre-season jersey. They had a gray one the year before they came to Allentown, I believe. Then a white one the inaugural season, followed by black and then orange last season. I’m thinking they go back to white, but there is a possibility of gray or my suggestion: Pick up the accent color and play in “electric blue” for a couple games. Many, many good seats are still available for this game–at prices cheaper than regular season. Walk up to the window to avoid some of the fees. I don’t have any new notes on parking yet; things seemed about the same as usual when I was downtown for the Flyers exhibition. 4. Who’s gonna be in goal tonight? It’s difficult to say. Alex Lyon played the entire game (and very well!!) last night in Philadelphia. We’ll likely see Dekanich, Muse or Irving–or all three. 5. How do you think the team is gonna do this season? That’s the million dollar question, right? As I said above, if you’re going to put together a squad to try to challenge for a Calder, this is about the way you do it I think. However, just like we saw on the baseball side this summer, the big team is all about moving ahead in their re-build plans, and if some of the young guys do well this season, you can expect them to earn a spot on the Flyers during the year. Just as I warned IronPigs fans, the roster might look mighty different in April when we’re thinking about playoffs, compared with now. Also, keep an eye on Reading, because we may need some of those guys to contribute this season, especially when the games get tight at the end of the campaign. A lack of quality depth in Reading could result in misfortune for the Phantoms down the line as the calendar turns to 2018. 6. Is there anyone left in Philadelphia to come down? Yes, probably. One forward is due to come–it could be an NHL veteran or it could be Leier or maybe even Lindblom (doubtful). One blue-liner as well, although you’ve got me about who it might be. It could very well be a vet like Andrew MacDonald, or could be one of the young bucks like Morin, Sanheim or Hagg.